Are you employed as a salesperson who is compensated, in full or in part, by commissions, and whose employer has retroactively changed your commission structure in order to stiff you out of your hard earned money. If so, your employer may be in violation of state and federal wage laws, breach of contract and possibly, fraud. A New Jersey employer cannot reduce an employee's compensation by changing the method of calculating earned sales commissions without any prior notice to the employee. 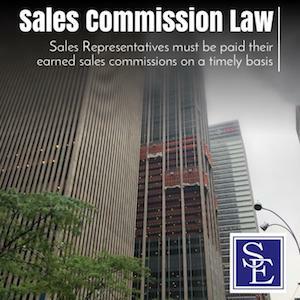 If you are employed as a salesperson, and your employer retroactively changed how you are to be paid your sales commission, you may have legal recourse to recover the money that is owed to you. The New Jersey Wage Payment law requires that employers pay the full amount of wages due to their employees on regular paydays. Wages are defined by the law as the direct monetary compensation for labor or services rendered by an employee, which includes sales commissions. Supplementary incentives and discretionary bonuses are not considered wages. Prior to changing the method of how to calculate an employee's sales commissions, an employer must first advise the employee of the change. Failure to do so, will give rise to liability under the New Jersey Wage Payment Law in addition to a potential claim of breach of contract. Employers are also prohibited from taking retaliatory action against employees for complaining about unpaid sales commission that are due and owing from the employer. Under the New Jersey Conscientious Employee Protection Act ("CEPA"), employers cannot take adverse employment action against an employee for complaining or threatening to disclose to a public body that they are owed an unpaid sales commission, if the employee has reasonable belief that the sales commission was earned and is outstanding. If an employer takes retaliatory action, such as a demotion or termination, in response to such a complaint, disclosure or threatened disclosure, the employer may be liable for the damages their unlawful actions has caused to the employee, as well as attorney fees and costs of suit. Our employment attorneys represent employees, including sales professionals, in an all areas of employment law. If you are employed as a sales person who believes they are owed a commission, or have been retaliated against for complaining about an unpaid commission, feel free to call our office to discuss your issue with one of our New Jersey employment lawyers.